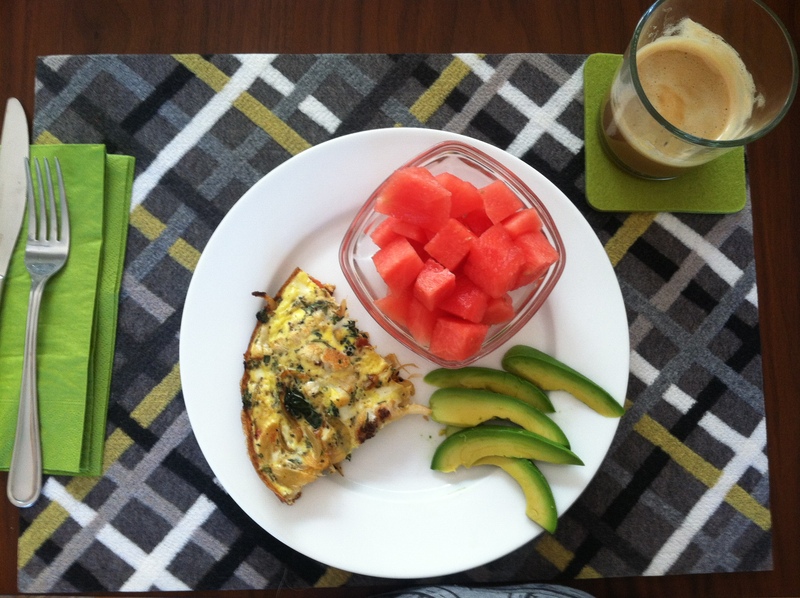 My favorite thing for breakfast is Frittata. Growing up my dad would sautee some vegetables, chop up some herbs, and mix in eggs to create a delicious scramble. After watching him do it 100 times, I took it to a new level, the Frittata. I love frittatas, because they are delicious, a great source of protein and you can experiment with all sorts of ingredients. Another great thing about the Frittata is that they can be sliced into nice, neat pieces that can be easily heated for another meal! There are several restaurants around town(LA) that make a decent frittata, like Comme Ca, Gjelina, and Tasting Kitchen, but homemade is the way to go!! While you wait for Onion and Bell Pepper to tenderize (10 minutes), chop other vegetables that take a shorter time to cook down, such as mushrooms, baby tomatoes, and a leafy green like spinach or kale. Once Onion and bell pepper are tender, mix in other vegetables. These vegetables will cook down fast (4-6 minutes). It will look like a wonderful vegetable medley ready to eat…. but don’t forget the main ingredient… Fresh, organic eggs! (Or just plain eggs if you can’t find fresh ones). Crack 4-5 Eggs in medium bowl, season with Salt, Pepper and Finely chopped Fresh Herbs (rosemary and Thyme), pour a splash(1 Tablespoon) of Milk or water, stir it up and poor it evenly over vegetable medley. Cook over medium heat for approximately 8-10 minutes; place lid on skillet, turn heat to low and cook for another 8-10 minutes. Frittata is down when all egg mixture is cooked solid. Use your finger to poke it to determine readiness. Serve with toast, avocado, fruit or if you eat meat, sausage or bacon! !